Why did the 1989 Chinese student movement end in violent confrontation at Tiananmen Square, despite the fact that both the Chinese government and the students very much wanted to avoid violence? This puzzle, which lies at the heart of the tragic events at Tiananmen, is addressed here from a fresh perspective that sheds new insight into these dramatic events. 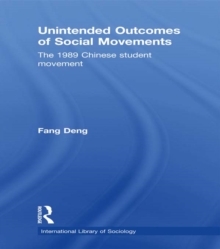 Throughout Unintended Outcomes in Social Movements, Deng applies the formal methods of game theory to elucidate some of the contingent, strategic decision-making by both sides in a social-movement/state confrontation, and how those decisions can - and did - lead to an unintended outcome. In identifying the necessary cause of the Tiananmen tragedy, namely a newly created social system with four highly specific properties, this book provides the first adequate explanation of the Tiananmen events. Because of this, it stands to make a significant stride toward convincing students of political conflict of the explanatory power of formal game-theoretic models. This book is an excellent source of reference for both undergraduate and postgraduate students in areas including Chinese politics, social movements, game theory economics, and social theory.